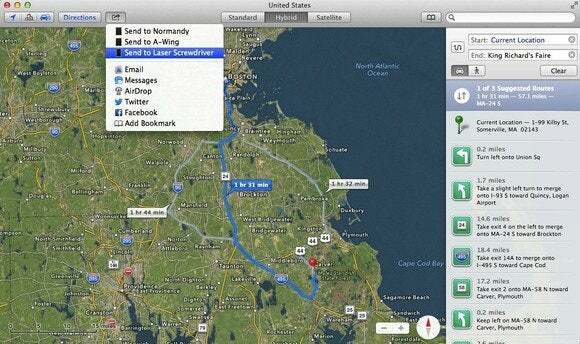 Mapping may not be as crucial on your desktop computer as it is on a smartphone, but Apple is betting you’ll still appreciate the fact that it has ported its Maps app to OS X in Mavericks. Keep in mind, though, that since OS X’s Maps pulls from the same databases as its iOS counterpart, any frustrations you’ve encountered with mapping data on Apple’s mobile operating system are likely to crop up on your Mac as well. 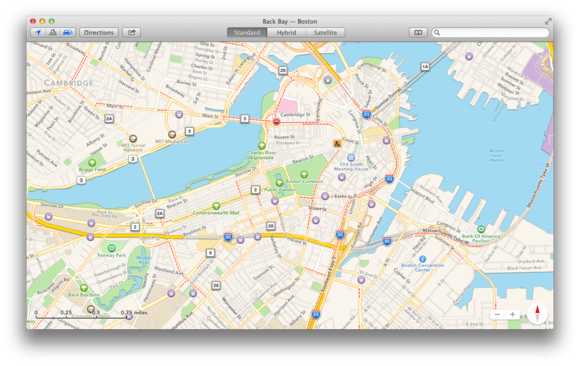 By and large, Maps on OS X will be immediately familiar to any iOS user. The map itself takes up most of the app, with a small toolbar of options at the top, as well as a few controls that appear on the mapping canvas. You have a variety of ways to navigate the map. You can click and drag to pan around the map, and double-click to zoom in. To zoom out, though, you’ll need to use either the zoom controls in the bottom right of the map, or the keyboard shortcuts Command-+ (the plus key) and Command-– (the minus key). Should you be using a Multi-Touch–capable trackpad, you can also use two-finger scrolling to pan around the map, and the pinch-in and pinch-out gestures to zoom in and zoom out, respectively. 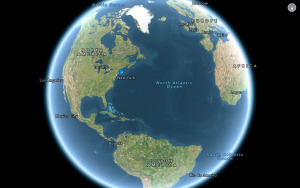 You can also use the rotation gesture—rotate two fingers on the trackpad, as if you were turning a knob—to spin the map. If you don’t have Multi-Touch controls, you can click and drag on the compass arrow in the bottom-right corner to rotate the map. Clicking once on that icon, using the Command-Up Arrow keyboard shortcut, or double-tapping with two fingers on the trackpad forces the map to snap back to north. 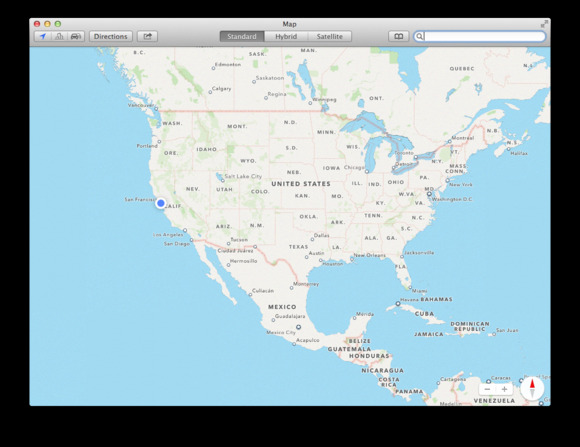 Mavericks’s Maps app bears an unsurprising resemblance to iOS’s version. One nice touch: As you pan around the map, the window’s title bar updates to reflect your location—including, depending on the zoom level, the neighborhood you’re looking at. If you’re trying to gauge distances, Maps by default provides a scale in the bottom left, which adjusts as you zoom in or zoom out. You can also disable that scale, if you’d prefer to reclaim the map space, by choosing View > Hide Scale. As you pan around the map, you’ll see a variety of icons denoting places of interest, including restaurants and bars, parks, hospitals, libraries, and much more. Clicking any of the icons pops up an info panel showing you the place’s Yelp rating and how many reviews it has. For more information, click the i button. The expanded panel has a lot of information, much of which depends on what type of establishment it is: Most entries will at least display the type of location and its distance from you. The panel for a restaurant, for example, will also provide the type of cuisine, cost, and hours against a backdrop of images from Yelp. Also included is a contact card with the address, as well as the phone number and website, where applicable. Below that you may get further information from Yelp; you can click a link to go to the full profile on the Yelp website. You can use Maps to get details about places of interest such as museums, parks, and coffee shops. Separate tabs at the top allow you to read a few reviews of the place (again, more are available on Yelp), as well as to view photos Yelp users have taken. At the top of the panel is a Share button to send this location via email, iMessage, AirDrop, Twitter, and Facebook (if configured in OS X), as well as to add it to your contacts or bookmarks. You can also perform the latter two options via buttons at the bottom of the info panel, and get directions to the location or report a problem. On the left side of the toolbar are three buttons that toggle additional information on the map. The first, a blue arrow, centers the map on your current location, if it can be found; the second, which shows a trio of buildings, changes the tilt of the map (and shifts the view into 3D mode, if available); the third, a pair of cars, toggles whether the map displays traffic information. To the right of those is a Directions button, which toggles the directions pane on the right side of the window. That pane provides fields for the starting and ending locations, and allows you to choose between driving and walking directions. It also displays any recent driving directions you’ve searched for, in case you want to access them again quickly. When you start typing in the Start or End location field, a drop-down list provides a list of potential options matching what you’ve typed so far, based on your bookmarks and search history, Apple’s own location database, and your contacts. Among the best features of Mavericks’s Maps app is the ability to send directions right to your iOS 7 device. Upon calling up directions, you’ll see alternate routes you can take, each highlighted on the map, along with a time estimate. Click each of those alternate routes or time estimates to make that set of turn-by-turn directions appear in the directions pane. Clicking any individual step highlights that turn on the map. If you want to get the reverse directions, just click the button with the squiggly line to the left of the Start and End location fields. 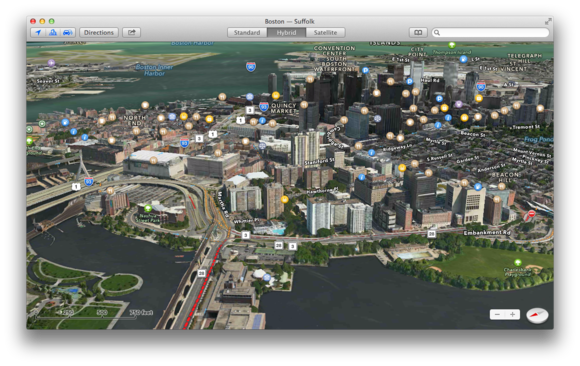 Perhaps the best new feature of Maps in Mavericks, however, is its integration with iOS 7. When you’ve plotted out a route, you can click the Share button to send the directions directly to your iOS 7 device (and share it via email, Messages, AirDrop, Twitter, or Facebook). When you send it to your iPhone or iPad, a push notification appears on the screen of that device—swipe it, and Maps launches and starts directing you. It’s a handy way to avoid laboriously tapping out your destination on a tiny on-screen keyboard. Traffic, which you can enable in the toolbar or by choosing View > Show Traffic, appears on the map as dotted lines, with colors indicating density. Red lines indicate heavy congestion, while orange indicates somewhat less heavy traffic. As in Maps on iOS, you have three different options for viewing maps: You can use the Standard mode, which shows a representative map; the Satellite mode, which displays satellite photographs; or the Hybrid mode, which, as the name suggests, is a mix of the two. You can toggle between the three views by using the buttons on the toolbar, selecting them from the View menu, or using the keyboard shortcuts Command-1, Command-2, and Command-3. In addition to the toolbar button, you can switch the map into 3D mode by clicking the compass in the lower-right corner, choosing Show 3D from the View menu (or using the Command-0 keyboard shortcut), or, if your Mac has Multi-Touch capability, holding the Option key and using two fingers to pan up and down. In the Hybrid and Satellite views, Option allows you to change the angle more than the other alternatives do. iOS’s Flyovers also make an appearance in Mavericks, giving you slick 3D views of many cities and famous locations. 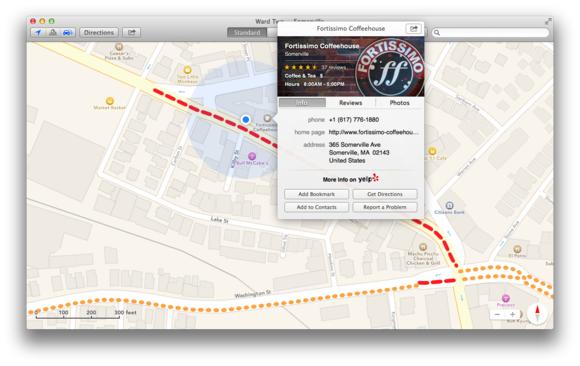 If you want to remember a place for later, Maps’ Bookmarks feature is useful. You can store a bookmark for any location on the map by clicking the pin or point of interest, clicking the i button, and then clicking Add Bookmark. You can also drop a pin anywhere on the map by clicking and holding, Control-clicking and choosing Drop Pin, or using View > Drop Pin or its keyboard shortcut, Command-D; by default the pin appears in the center of the map window. If you want to clear an existing dropped pin, you can either drop a new one or choose View > Clear Pin (shortcut Command-D). You can access your saved places via the Bookmarks button in the toolbar. By default Maps pulls in your OS X Contacts, as well as your recent search history, in addition to any bookmarks you’ve added; it also syncs your recent searches via iCloud. To remove Bookmarks, click the Edit button while you’re viewing them, and then click the X icon next to the bookmark you want to delete; you can’t selectively edit your history, but you can click the Clear button while you’re viewing recent searches to erase it.